U.S. #1131 is the first stamp to be issued jointly between the United States and another country. The Post Office Department collaborated with Canada to release a stamp for the St. Lawrence Seaway. 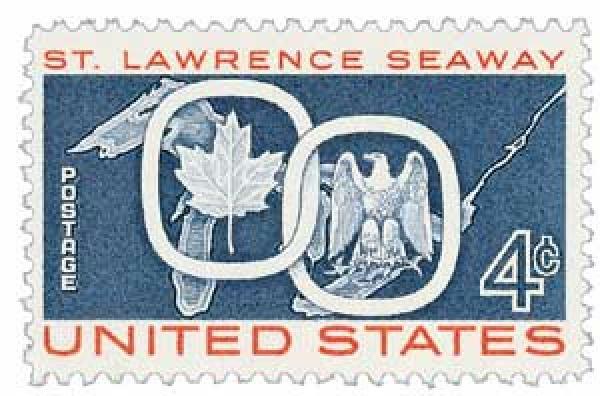 The U.S. stamp was issued in Massena, New York, while Canada’s stamp was issued in Ottawa. Joint issue stamps are stamps issued by two or more countries that each release a stamp with a similar design on the same day (or within a few days). Since the first joint issue in 1959, the U.S. has participated in 40 joint issues. America’s most common partners have been Canada and Sweden, with five joint issues each. The St. Lawrence Seaway is a major commercial shipping route that links the Atlantic Ocean and the Great Lakes. The seaway extends from Montreal westward to the eastern shore of Lake Erie. It is formed by the St. Lawrence River, several lakes, and a system of canals and locks. In total, the seaway has about 65 miles of canals, plus 15 locks and three dams. Before the seaway was opened in 1959, cargo ships could not navigate many parts of this route, due to shallow or rough waters and changes in elevation. Additionally, the seaway includes a hydroelectric dam that supplies power to parts of Ontario and New York. This dam created Lake St. Lawrence, which is more than 30 miles long. The hydroelectric project began producing power in 1958. A joint project of the United States and Canada, construction of the St. Lawrence Seaway began in 1954 and was completed in 1959. Canada administers about 55 miles of canals and 13 locks. The U.S. runs 10 miles of canals and two locks. In New York and Ontario, entire communities had to be relocated because of the project, as these areas were flooded as part of Lake St. Lawrence reservoir.